By the end of the nineteenth century, American commercial theater was becoming increasingly entrenched in stereotypical modes of production and a limited repertoire that was largely generated in New York before moving on established circuits to other parts of the country.Although twentieth-century scholarship on early American theater has defended a number of nineteenth-century plays and playwrights, Edgar Allan Poe, commenting as early as 1845 on one of the better new American plays, Mrs. Mowatt's Fashion, reflected a stream of later critical opinion when he remarked: "It is a good play-compared with most American drama it is a very good play"; in the United States "the intellect of an audience can never safely be fatigued by complexity." In any case, two developments began to liberate artists interested in performing a larger range of serious poetic drama from dependence on the theater syndicates that dominated the late nineteenth-century theater world and to invite new audiences to attend Greek tragedy: the growing success of Greek tragedy on college campuses from the 1880s to the 1930s and the establishment of new venues for performance that permitted theatrical experimentation in stagecraft with strong links to Greek theater in the minds of major theorists and practitioners. Outdoor performances across the country, including those in sports stadia and in new amphitheaters often built on college campuses, here complemented the founding of small, innovative regional theaters. Part 1 of this chapter first considers why nineteenth-century native efforts at presenting Greek tragedy on the professional stage, and especially translations of the original plays, met with an uninspiring reception. It then looks at how a growing number of university productions, along with small touring Anglo-American and American professional groups who primarily performed on college campuses and at other local venues, paved the way for remarkably successful productions in the second decade of the twentieth century. In 1915, the prominent visiting British director H. Granville Barker took advantage of this trend by staging Euripides' Iphigeneia in Tauris and Trojan Women in eastern college stadia. This book explores the emergence of Greek tragedy on the American stage from the nineteenth century to the present. Despite the gap separating the world of classical Greece from our own, Greek tragedy has provided a fertile source for some of the most innovative American theater. Helene P. Foley shows how plays like Oedipus Rex and Medea have resonated deeply with contemporary concerns and controversies—over war, slavery, race, the status of women, religion, identity, and immigration. 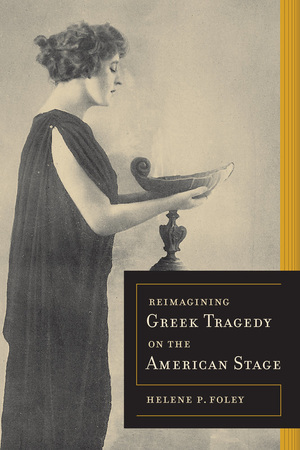 Although Greek tragedy was often initially embraced for its melodramatic possibilities, by the twentieth century it became a vehicle not only for major developments in the history of American theater and dance, but also for exploring critical tensions in American cultural and political life. Drawing on a wide range of sources—archival, video, interviews, and reviews—Reimagining Greek Tragedy on the American Stage provides the most comprehensive treatment of the subject available. Helene P. Foley is Professor of Classics at Barnard College, Columbia University, and the 2008 Sather Professor at UC Berkeley. Her many books include Ritual Irony and Female Acts in Greek Tragedy . “This eagerly anticipated volume covers enormous ground with great skill and insight. It demonstrates unequivocally that the ancient plays have not simply been central to life within the American academy; they have also routinely been at the forefront of innovation and debate within the American theatre.”—Fiona McIntosh, Director of the Archive of Performances of Greek and Roman Drama, University of Oxford.